100 years ago, the Paris Peace Conference of 1919 had just convened with the first of 145 meetings between the statesmen of all sides. The final peace treaty with Germany, The Treaty of Versailles, was signed on 28th June 1919 but negotiations between other nations continues for a further four years with the Treaty of Lausanne (peace with the former Ottoman Empire) being revised right through until the summer of 1923. While it would be lovely to continue researching the impact that WW1 had on Norfolk sadly the time has come to stop updating this blog. Over 50 different people or organisation have written posts for us, whether this is research into a topic that interests them; family/village history research or reviews of WW1 commemoration projects. We launched the 2018 Poppy Plea which saw over 15,500 poppies being made for us to represent the fallen of Norfolk. We couldn’t have done any of this without you – our readers and contributors – so many thanks for your support and interest over the centenary commemorations. 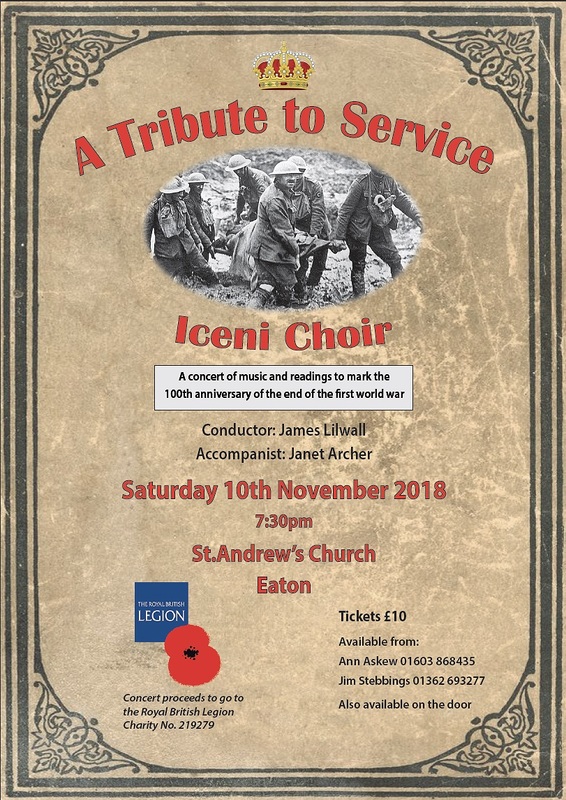 With the 100th Anniversary of the Armistice fast approaching we are pleased to be able to share some of the events happening around the county with readers of the blog. Details of price and how to book are on the poster below. A sneak peak at the programme has been provided and it will include music performed by the whole choir as well as just the male or female members, all of which will be interspersed with appropriate readings. As the 100th Anniversary of the 1918 Armistice approaches we are being told of more commemoration events being held here in the city. The Castle Museum is holding an exhibition called “Armistice: Legacy of the Great War in Norfolk” which opens on Saturday 20th October and runs until 6th January 2019. The new Castle brochure which can be picked up in the Norwich Forum and at Tourist Information Offices (as well as many other county locations) is full of event listings supporting this exhibition – and regular blog readers may spot some familiar names and themes! 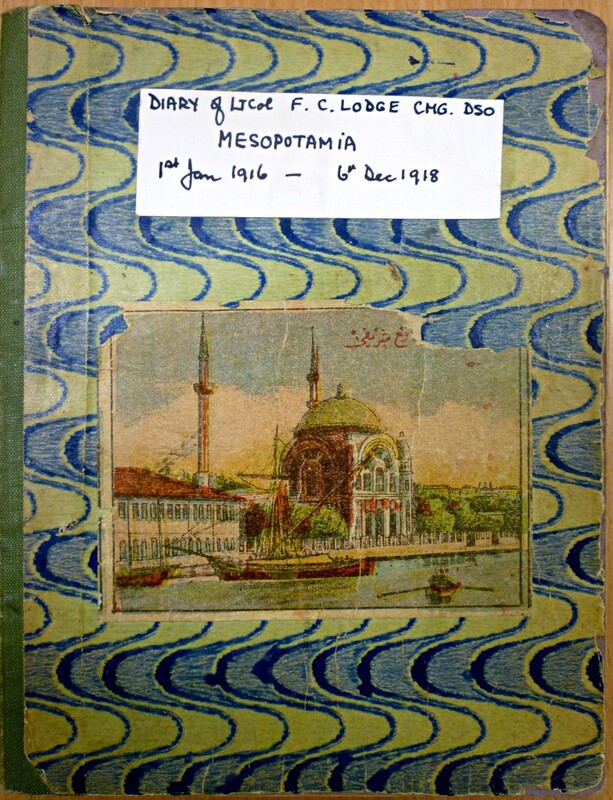 After a well deserved rest (and undertaking more research) our Mesopotamian correspondent is back with the further experiences of the Norfolk Regiment’s officers during their captivity in Mesopotamia. This is a continuation of the postings of 16 November, 2016, 26 May, 2017 and 16 June, 1917. Some entries have been omitted if they are unduly repetitious, or where they contain financial details other than about pay or refer to private family matters. The diaries are held in the archives of the Royal Norfolk Regimental Museum. After being transferred from captivity at Yozgad (Yozgat), Lodge had arrived at Afion Kara Hissar (Afyonkarahisar) on 1st November 1817. It is at this place that his diaries continue. Rain during the night, with snow in the morning – dull. Paid Julius 12 liras for messing – dull. All dull days, and more snow on Friday night [4th-5th]. Brighter and freezing 11° [F.]. Recd. 5 liras Embassy Money. Letter from Robert Berry d/ 27 Oct and post card from M. [his wife, Margaret] d/ 25 Oct.
10 officers p of w arrived early this morning from Palestine Front. One of them, Gardiner, had been in our first Bn. We moved into a new house today. I have now a small room to myself. Still bitterly cold 18° [F.] of frost. Freezing hard 7° of frost during the night. Thomas lies with us now. They have stopped our bread ration from gov. [government] supply. We now have to buy it in the bazaar at 8½ ps [piastres] a loaf instead of 2½. A splendid thaw, it is now quite mild. Milder. We hear that they are going to reduce our pay. This will make living all the harder – even now it’s impossible to exist on what we get. ; this has been supplemented by private income. Wrote letter 64 to M – and to Genl Mariott & Richardson. Fine bright weather with frosts ar night & early morning. Philpot R.F.C. Who arrived here sick with dysentery, died and was buried today. We had 3 shocks of an earthquake during breakfast – 3 at dinner & 2 during the night. Some were strong & shook our house considerably. Post card d/ 12th Nov. from M.
Fine & sharp. Letter from Robert [his 3-year-old son] d/ 13th Dec. Both days bright & frosty. Two letters from M. 89 & 91 d/ 9th 14th Nov.
Letter from Mother 31st Oct.2 letters from Ethel d/ 28 Sept 6th Nov.
Co. Wilson, Father Mullen, & Foster left after dinner for Stamboul [Constantinople / Istanbul] all are unfit & hope to be discharged. Misty & raw. Another mail in. All misty days, except on Tues. the sun came out after lunch. Began to snow again this morning – it is milder. Bright intervals, milder: but walking in the street very muddy. Julius had a splendid batch of clothing parcels: he gave me a blanket, 2 shirts, 2 towels, 3 pr. of socks, 2 pr. pyjamas & a pair of shoes. Bright & frosty. The 4 Frenchmen who were sent to Stamboul for exchange all returned this morning. Wrote 66 to M – Evelyn – Mrs Daunt. Parcels given out this morning – I got 8. 1lb. 3 Nunns tobacco & pipe. These arrived in the nick of time, & were most welcome. A shell from Cecilia [his daughter, twin to Robert]. Went to watch a rugger match. Fine & bright, only a slight frost. Received money for a £10 cheque I had signed some weeks ago. It was paid through the American Express Coy – really a German company*, I only got 1128 ps a pretty good swindle considering the real rate of exchange. Had tea with Trelson [?] R.F.C.